Over at Stock*Pile comics dot com. We have a little hashtag going called #yearofstockpile. Where we are all working hard to make 2016 a great year for releasing our own comic books! I am pleased to announce that the first book of 2016 is Return to Rander The Blood Isle #1! It came out this month and just last week in local stores in the Boston area. And it is always for sale in my online store http://www.sedani.storenvy.com.Find out what happens after the events of The Lone Savior Graphic Novel! And please, stay tuned for lots more from Stock*pile this year. My new favorite war hero! 8 x 10 ink and marker. Hey Rander fans. This week on Sunday in Rander I wanted to have some fun! 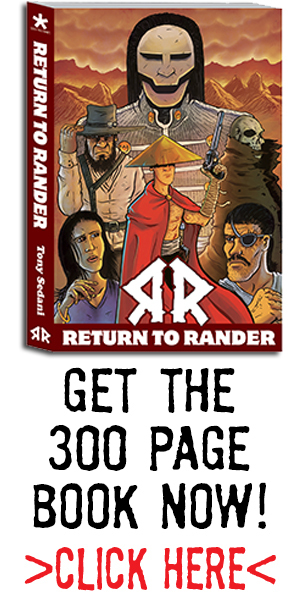 If there were to be a movie or TV show made of Return to Rander who would be cast? Well, I had some fun casting some of my favorite actors currently. Let me know what you think, or who you would pick in the comments below! And if anyone with some good photo skills wants to make a fake teaser poster with these actors, by all means please do so! Small piece I recently did. A recent piece. Original is for sale in my store!